These predictions were made as of 18/12/2009. Updates are noted with dates. This article is essentially speculation, the discoveries listed here may sound weird and strange, and for all I know could be decades or centuries into the future or even impossible. Nevertheless…. Oh and the images are random collages thrown together to break the monotony of text and provide further food for thought. Genetically Modified Food Added 29th Dec ’12. Yes, this is already a reality, but it has not been accepted by people because of what it may do. I don’t think this belief is founded in science. Anyhow, the reason this is listed is because, even though it is technologically a reality, in practice hurdles remain till the public accepts it fully. And there’s no way of saying when that will happen if at all. But if it does, another Food Revolution could be underway. This is already happening, because nuclear energy appears to be the only pollution free source of energy that is reliable, has adequate capacity, has been deployed previously on a large scale (in other words is tested) and is price competitive with existing methods of generating energy. 16/05/2011 – The Japanese earthquake and resulting damage to the nuclear plants along the shore were a PR disaster for nuclear power, and have turned public opinion just when it seems nuclear power was on the brink of a renaissance. It remains to be seen if the noises governments are making about looking more carefully at safety are just that or if the anti-nuclear sentiment persists. When processors become powerful enough and optical circuits small enough, 3 dimensional displays will produced a new level of immersion simply unachievable by standard 2D displays. Or you can just choose to wear weird spectacles and buy the 3D TVs that are becoming available now. The Nintendo 3D is a display which heralds what will soon be available. I think this would have to be full touchscreen based since keyboards take up too much space. Also it would have to be foldable or have two parts so you can use just the phone functions when you want too. I mean you don’t want to hold a computer to your head to make a call. It could have a phone part that fits in your pocket, but which can also be joined to the computer part when say you want to watch a movie. While flash memory is rapidly increasing in capacity, it remains prohibitively expensive for secondary memory. Within a decade, we should see the development of the next generation of memory which would offer virtually unlimited storage. By then internet speeds and capacities would be greatly expanded. This could culminate in the cloud computing concept where everything is stored on remote servers and streamed, or if the memory is cheap enough, people could simply store anything that catches their fancy with their high speed internet. High speed internet will come about once fiber optic cables become cheap enough. Examples are the traffic updates on Google Maps made possible by reports from people who possess phones with GPS sensors that tell Google they are driving through the traffic and concomitantly their speed. This is only possible because their phones have GPS sensors whose data Google can analyze. Another example, top of laptops have accelerometers to detect if they are falling so that moving parts can be turned off. These sensors can be harnessed to measure earthquakes and provide a cheap network of sensors. In this manner, from being data poor, our society will become data rich and the work will now lie in making sense of this data. This comes after cheap storage and fast networks because those are pre-requisites for moving data around and storing it. RFIDs are another example. The other day I was reading about a Brazilian project to track cattle using a RFID chip for each head of cattle. Solar range in efficiency from 20% to 50% depending on the cost. The ones on satellies work at 50%. Most other solar cells work at 20-30%. Solar energy is the easy to harness, the Sun is everywhere but doing it in a cost effective manner has eluded scientists till now. One way to bolster solar energy would be to raise the cost of electricity generated by coal, a ‘coal tax’ but isn’t practical. We simply have to wait for solar cells to advance. If cameras & processors get small enough, and use less power, then along with the invention of a small, high capacity battery you could have a miniature camera fitted onto your person which would continuously record everything you do and send it to a secure, remote storage location. In event of anything untoward happening to your (like a crimes) this record could be accessed. This would make crimes like murders easily solvable. Of course you’d need appropriate privacy protections to ensure this isn’t misused. This would be a combination of tissues grown on scaffolds and the latest in electronic miniaturization to create fully synthetic prosthetics that can interact with nerves to perform the same functions. For example, a device with a camera interfaced with the Optic nerve could restore sight. Taking this further, this could lead to information overlays. Say you’re a tourist in New York, the overlay immediately brings up nearby places to eat, places of interest etc.. with directions and all this is superimposed on your normal vision because this vision is being passed through a processor. Quantum computers can work through solutions to several problems much faster than present computers can, because they compute such that every possible value of the variable is worked through simultaneously. The power afforded by quantum computers will make a whole host of processes work faster, and simulations and modelling will become much, much easier. The downside is that encryption will be broken. This means, someone could record your data now, and break the encryption when quantum computers come along. Viruses can be used to deliver genetic payloads to cells to alter genes. This is decades off, depending on whom you ask, but its the Holy Grail for the energy industry, limitless pollution free power. This would be a massive advance, conductors with zero resistance would revolutionise…well…everything. Way off into the future, this point is inspired by Kim Stanley Robinson’s Mars Trilogy. A complete understanding of how the brain works could help in fabricating chips that assist the brain by providing what it is lacks. We all have experienced times when we wished we could remember something but we couldn’t. If the brain is understood, electrodes can be placed on the skull that decipher what you are thinking of, and relay this information to memory circuits which are interfaced to your brain. These circuits immediately send the data you need, so you’ll never forget a thing. Or maybe you want information on a subject, this thought is detected, say the Wikipedia entry is looked up and the information directly relayed to you. With biochips that interface between neurons and electronics, our brains are directly plugged into the internet, information can be recalled at the speed of thought, and communication is instantaneous. At the same time, we will modify and manipulate our neural networks into working faster. This increase in the brain’s processing speed along with the ability to communicate instantaneously will lead to an unimaginable jump in human society’s information processing power. Personally if you ask me this is never going to happen, at least not with the current thought process regarding coding a supercomputer or a hive of computers. If you don’t know programming, ask anyone who does, you need to tell a computer how to handle every little situation. Without humans to tell the computer how to think, they’re just empty boxes. Again inspired by The Mars Trilogy, this would be the biggest step for civilisation since the formation of permanent, agrarian communities. This is just a dream and will possibly remain so forever, but if and when the instantaneous movement of matter is ever achieved, it would mean that we have nothing left to discover. 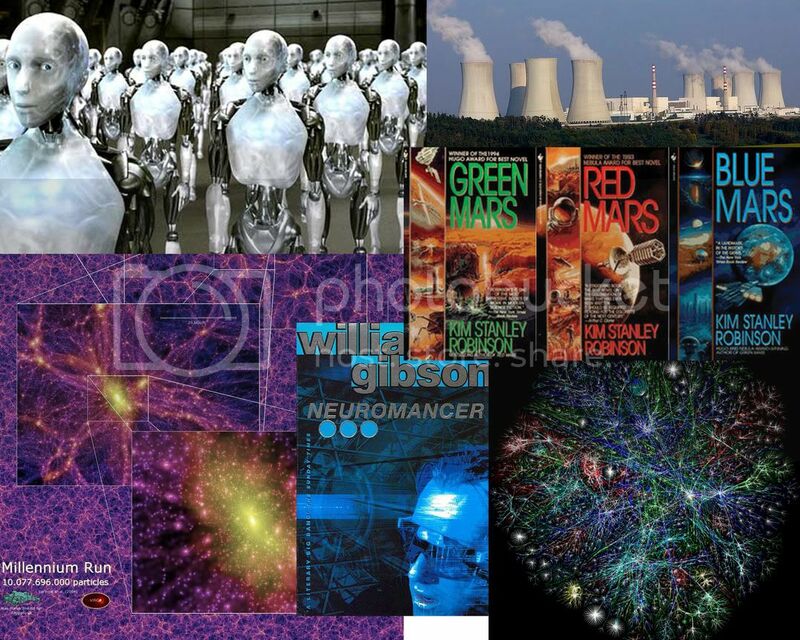 Clockwise: Robots in I, Robot. Nuclear power plants. Covers of the Mars Trilogy books. Visualisation of the internet. Cover of William Gibon’s Neuromancer. Visualisation of a modelling of the universe “Millennium Run”.